If it were up to me, I would have gone with G.I. Joe. My Barbies always preferred him over my Ken doll anyways. About Him: Bob is a captain in the army currently stationed in the Middle East and was on his way home for leave. He loves Emma Watson, bacon and the adrenaline of knowing that every day he can get killed in the war. If that’s not the wildest combination of passions you’ve ever seen, then I don’t know what is. Most Dangerous Experience: Bob’s most dangerous experience was during an off base mission in a bad part of a city that’s already in a dangerous country to begin with. He was traveling in a convoy, when the entire convoy got stuck in traffic. This is dangerous, as Bob explained to me, because you run the risk of someone sticking C-4 to the side of one of the cars. It’s amazing how something the size of a fist can take out an entire car and kill a few people. Luckily, the traffic cleared and the convoy left the city safely. Best Advice: Everything is about balance. Your job can’t be everything about you, just like your family can’t be everything about you. Same way you can be sober for nine months and start drinking at the airport- balance. We left the restaurant and Bob walked me to my gate like a true gentlemen. My flight was boarding, but I was having too good of a conversation to care, so we headed to the concourse bar for a tequila shot, followed by Kinder Eggs from the airport shop. Ironically, he chose a Barbie themed Kinder Egg for me. I was the last person on my flight, but it was well worth it. It’s people like Bob who remind me why you should always strike up a conversation with the person next to you. You never know just how interesting they might be and what new world you might discover! 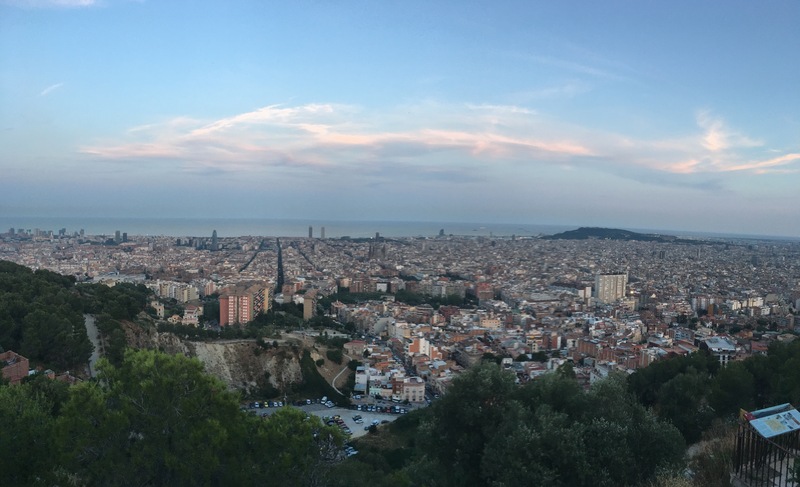 *Not pictured for privacy, but here’s another nice view of Barcelona for you. Lost and Found on Gili T.
After Bali, the boys and I spent two nights on the Gili Islands, an archipelago of three small, largely unknown islands off the coast of Lombok. I promise those are all real names of places, yet I myself still don’t know if it was reality or an elaborate two day dream. We spent our first night on Gili Meno, the quieter of the two islands, in a bamboo house. My parents were some of the first few foreigners to visit the Gili Islands, having been there in 1986, so naturally I had to visit the resort they stayed in and sure enough, it was still standing. It was cool to see how the island hadn’t changed too much since their visit. Locals slept in outdoor shacks, and there still wasn’t a single motorized vehicle on the island- it’s nice to see that places like that still exist in the world. After one night we realized that we are creatures of comfort and prefer private bungalows to bamboo huts, so we moved to the larger party island and went directly to Sunset Bar. The days all blended into each other and none of us ever wore much more than or swimsuits, but I’ll do my best to explain what it was like. Imagine a place where the colors of the sunset are more vibrant than anything you’ve ever seen. Where the only mode of transport is either horse carriage or bike, and the roads are lined with beautiful beach bars, one after the other. Imagine swing sets over water that ripples in color like gasoline reflecting in the sun, vibrant house music that constantly pulses around and through you, and soft clouds that dance above you. And lastly, imagine a place where everyone is just vibing out, happy and at peace. It was a place to lose yourself, only to pull yourself back out and reconnect with all that you’re made of, which was fitting because exactly a year ago I had completed the Camino de Santiago- which as you may know, was one of the main shaping factors of my life to date. Bali and the Gili Islands were a very welcome break in our fast pace, but now it’s time to keep rolling. We’re flying to Kuala Lumpur for a stopover on our way to Bangkok, while a man with a ukulele serenades the flight. Looks like it’s going to be another great day. I have a vision. An idea of how things are supposed to go, of how they’re suppose to look. Almost everything is planned, and well thought out. 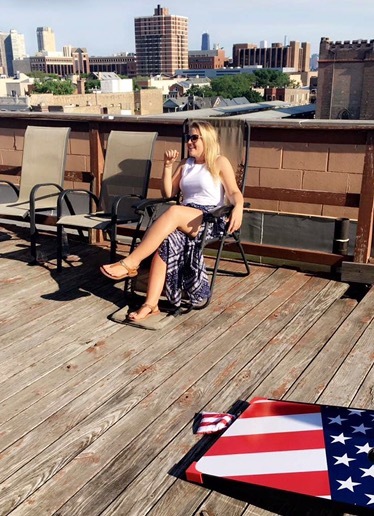 My trips may look effortless, but I’ll be the first to admit they’re not. This trip itself is a culmination of hours on a computer searching for flights and booking hotels rooms, reading books and guides, consulting with my parents, and chatting with the guys to plan the details. Don’t get me wrong, I love every minute of planning. Honestly, searching Skyscanner for flights is more of a hobby at this point. But you can understand how there’s an immense pressure for everything to work out just the way you hope it does. However, when you’re traveling, you realize it’s never going to be perfect. You’re going to be sweaty, and you’ll be covered in bug bites, and you might get ripped off, and you might book a hotel that’s a little too far. It took me a hot, sweaty field of rice to realize that. My mother sent me a photo of herself in the rice terraces of Ubud, Indonesia, in 1986 when she was 23 years old. She was here exactly 30 years ago, and it was such a perfect opportunity that I wanted the perfect photo. So, for half an hour, I hiked through rice terraces trying to find the exact spot she had taken hers. 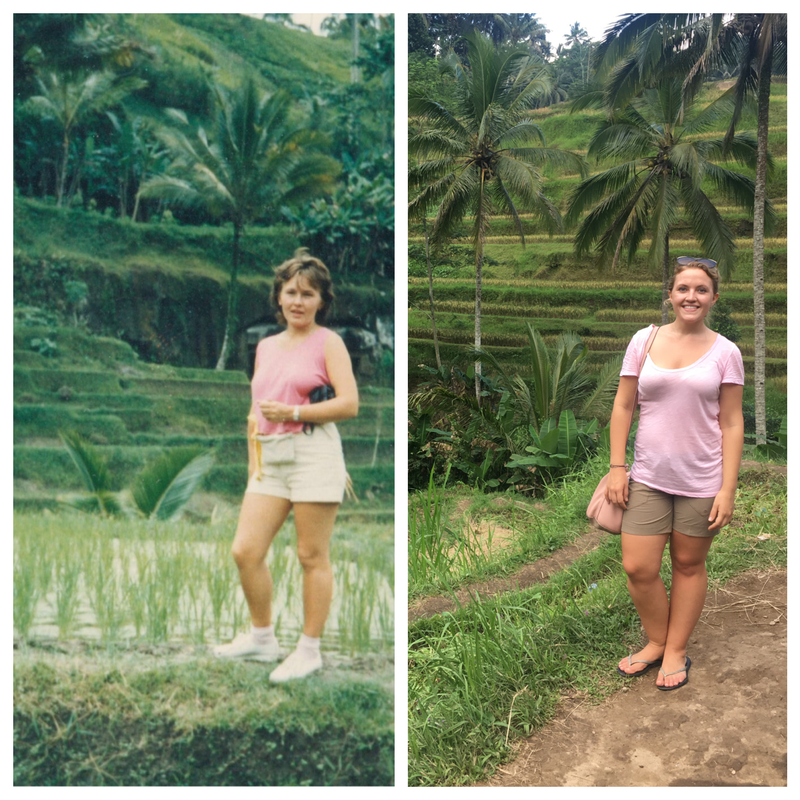 In retrospect, finding a specific place in a massive rice field 30 years apart is an almost impossible task. Yet, there I was, hot, humid, exhausted, sweating and frustrated, dragging my friend Nick around, trying desperately to find that little patch of field. We both felt like we were melting, and we were losing patience. At one point, my flip flop got stuck in the mud and broke. I stood there silently trying to keep myself from unraveling. Nick looked at the flip flop, looked at me, and looked back at the flip flop, and didn’t say a word. In mutual agreement, I didn’t speak either. After about a minute, I gathered myself enough to fix my flip flop and kept going. I found a spot that I thought was beautiful, and Nick took my picture, saying that it didn’t have to be perfect. Once we got back in the car, the A/C hit and we were human again. Nick and I started to laugh and he told me that when my flip flop broke he knew that there was nothing he could say that would have made anything better, and I laughed, admitting that if he had said one word, I probably would have cried. I put my photos side my side, and realized that everything was actually perfect. I got to be the in the same place my mom was at my age, and I had a good story behind it- and that all made it wonderful. So, you see, nothing is ever going to be perfect. And that’s okay, because it’s going to be perfect in its own way. As previously mentioned, Singapore was one of my favorite cities. It’s beautiful and luxurious, clean and organized, and arguably one of the most urbanized cities in the world. Their metro is great, the food even better, and as a bonus, potted flowers line their roads. And, it’s not far from Bali and tons of gorgeous getaways. The downside is that Singapore is a very strict place, with somewhat extreme punishments for breaking their laws. No gum chewing, no smoking, no cuddling, no jaywalking, no singing to inappropriate songs. We would jokingly yell, “15 years hard labor,” or “death penalty” at one another whenever someone did something a little questionable- but we all knew there was a little more truth in that than joke. After a rough night that included me having a dance off on an empty dance floor with a stranger in Clarke Quay, the three of us yelling along to Rihanna’s “Only Girl” at a karaoke bar at which no one was rowdy but us, and us singing to Drake’s “One Dance” after a cab driver refused to play music, we made our way home- or more accurately, to the 7/11 across from our hotel which we frequented too often in those two days. We hadn’t had our fill of singing and dancing for the night, so we decided to go to a bar next door called Sassy Bar. We walked in and the boys were immediately swarmed by a group of women in tight dresses. I still insisted on getting a drink, but the women said the bar was closed, so we turned around and walked right out. For a place where so many things are illegal, a house of ill repute was quite puzzling. But hey, it is the world’s oldest profession. Aside from the great nightlife, the sights in Singapore are unreal. The infamous Marina Bay Sands-an impressive structure consisting of three separate towers propping up a boat-like building on the top, makes for an incredible view of the city. It’s lovely because when you’re at the club on the top floor and don’t feel like talking to anyone anymore, you can just gaze out at the lights reflecting off the harbor. 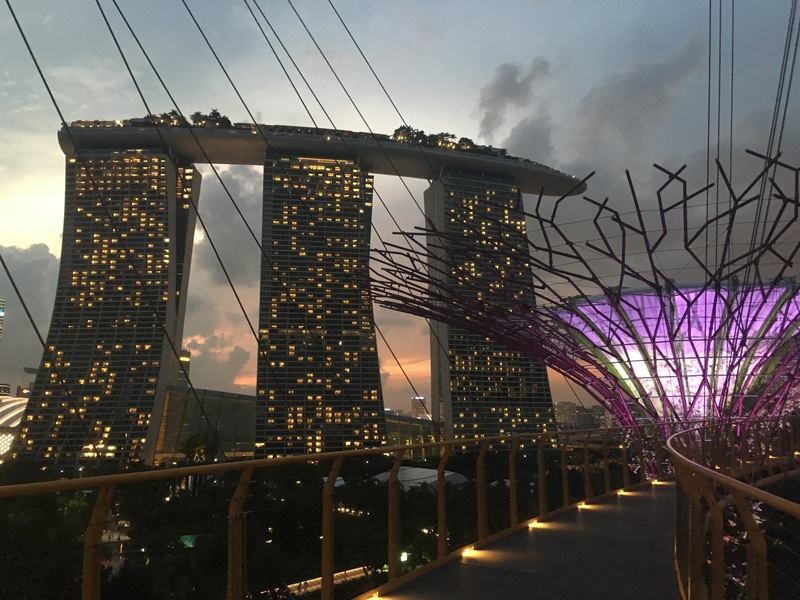 The Supertrees in Singapore are also out of this world; they literally look like a scene from Avatar. Supertrees are imposing artificial trees covered in plants that act as vertical gardens, and generate electricity (I know that’s a lot to take in, Google it). If you want to know what the future feels like- this is it. I would have been more sad to leave this artificial Utopia, if it weren’t for the fact that Bali was next. Oooh baby. A year ago today I was about to begin the biggest adventure of my life- the Camino de Santiago, which, over the course of three weeks, showed me what I’m made of, gifted me some of my dearest friends, and paved the way for an incredible year. So it’s only fitting that on this Camino day eve, I’m about to embark on another journey of a lifetime. Tomorrow I leave for a two month long trip to Southeast Asia and Australia. I’m starting in San Francisco and then heading to Seoul, Hong Kong, Singapore, Bali, Laos, Cambodia, Kuala Lumpur, Vietnam and Thailand with three friends. Afterwards, I’m making my way solo to Australia to check out Melbourne, Cairns, and Sydney- swinging by Auckland on my way back to San Francisco. Finally, I’ll head directly to Ann Arbor to begin adulting. Phew, that was a mouthful. I honestly don’t know how I didn’t have an aneurysm planning this trip or packing for it (I credit my youth). Like, have you seen their outlets? And what does one wear when it’s humid and about 100 degrees, and you also sweat like a swamp monster, but you want to look cute for the gram. See, Europe is easy – I can pack that suitcase morning of the flight (really bad habit, don’t recommend). But aside from Japan, I’ve never ventured to this part of the globe. Asia and Australia are the great unknown- which is precisely why I’m going. So, dear readers, I invite you to follow along over the next few weeks. Meanwhile, wish me luck while I sit on top of my suitcase trying to zip it. Iceland has been conquered and it’s time to go home to rest and reset before the next big adventure. In these past ten days my father, brother and I made a full circle around the entire country (which sounds a little less impressive when you realize that Iceland is the size of the state of Illinois) and I can say that I have fully experienced the land of Vikings. 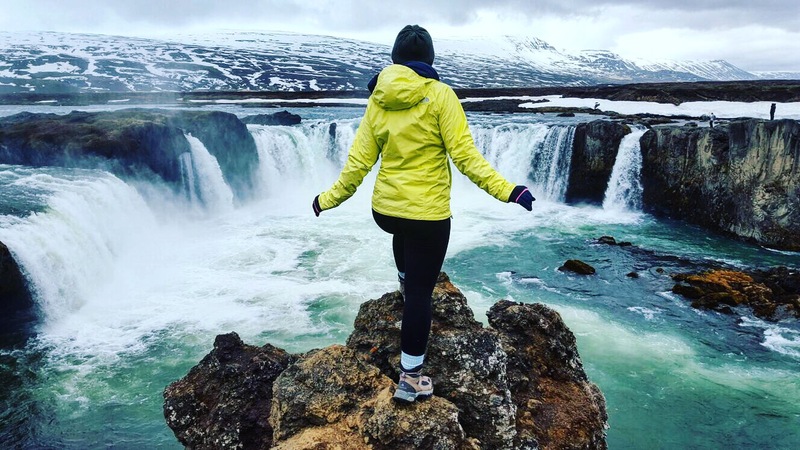 I’ve been splashed by the waterfalls at Kirkjufellfoss, I warmed up in the geothermal baths in Myvatn, I tasted Hakarl (fermented shark) in Stykishholmur, and I wandered the streets of Reykjavik snacking on Skyr (Icelandic yogurt). And that was just the last three days of my trip. All of this was possible because Iceland is a land of convenience. One main road, appropriately called Ring Road, circles the entire country allowing you to explore the highlights of each region without straying off the path. Hypothetically, you don’t have to even leave your car. It’s like being on an African safari. But it’s cold. And there’s are no wild animals. And you should probably leave your car. And why wouldn’t you? There’s waterfalls with Viking curses on them, craters that have inspired classic novels, volcanoes that have paralyzed all of Europe, and moss covered lava so soft that you’d want to sleep on it. There are tons of other surprises and quirks, too. In fact, you can even visit the goat that was chased by Khaleesi’s dragon if you’re a Game of Thrones fan. Something I failed to mention while I was whining about how pricey the food is, is that it’s also very good. This is seafood heaven (or should I say, Valhalla?) and I had fresh caught salmon so good that I had tears in my eyes. Realistically, I know that not everyone can take ten days off, fly across the Atlantic, rent a car and speed off into the Icelandic sunset (just kidding, the sun doesn’t really set in the summer)- but, my dear friends, I urge you to consider a stopover in Iceland on your next flight to Europe. I’m done ranting and raving, but please drop me a line if you’re adding it to your bucket list and want to know more- I’d be happy to chat.